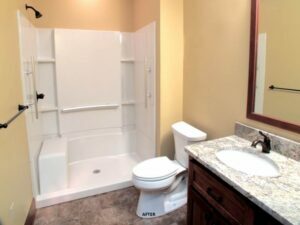 When it comes to Columbus, Ohio room additions, we know that you might have many reasons for wanting to add on to your home. One of the increasingly growing reasons we have noticed is due to aging parents. Building an in-law addition for your elderly parents has a number of advantages over sending them to an AssistedLivingCenter. Instead of sending elderly parents to a nursing home many people today choose to build an in-law addition onto their home for their elderly parents. Building an in-law apartment for aging parents gives them the opportunity to live in a more comfortable environment and allows both their children and grandchildren to see them more regularly. You also have the piece of mind that your loved one is only a small distance away and you can help them should they need assistance. Building an in-law addition is unlike building any other type of home addition. They typically include a bathroom, kitchenette, small bedroom and a living room. Consequently, they are larger and more expensive to construct than a typical room addition. An in-law apartment is usually built as a wing on the side or back of a home. In-law additions also need to include additional safety items, such as safety grip bars in bathrooms, and wider doorways and hallways. In some cases they may also need to include a ramp for wheelchair accessibility into the suite. We have posted previously about our experience with aging in place; let us keep your loved one safe! Electing to build an in-law addition provides several benefits. First of all, your elderly parents can live next to you, but still provide personal space and privacy to them and you. Second, an in-law suite allows your parents to live a higher quality of life compared to living in a nursing home. Lastly, building an in-law addition can be expensive, but it can save a fortune on nursing home costs, thus protecting your aging parent’s savings and when prepared, designed and constructed properly the in-law addition can even increase the value of your personal dwelling. The blessing is every design decision can be very specific to your family’s current and evolving needs! We at NJW would love to meet with you and discuss your needs. We currently build in Westerville, Worthington, Whitehall, Upper Arlington, Powell, Pickerington, New Albany, Lancaster, Hilliard, Gahanna, Dublin, Bexley, Columbus and all of Central Ohio. Contact us today!